When you think Italy, you think Tuscany or Umbria, Venice or Rome, Amalfi Coast or the Great Lakes, Chianti or Parma. South Tirol will not immediately spring to mind, most likely because you are inclined to consider this to be Austria rather than Italy, by the looks of it. Once this northern part of Italy belonged to the Austro-Hungarian county of Tyrol but at the end of the first World War, it was annexed by Italy. Despite numerous and harsh attempts to Italianize the region you still feel the Habsburg presence in everyday life: German names, cuisine, architecture, costumes… Locals feel Germanic and refer to fellow countrymen of the South as ‘those Italians’ as if they are talking about a different people. This can all get very confusing if you forget where you are. Once you have managed to get passed innumerable German roadworks and the narrow mountain passes you arrive in sunny South Tirol. If, for some reason, you missed the landmark at the border you might not realise you changed countries. The only giveaway could be the temperature which is slowly going up on this sunny side of the Alps. While you are making your final descend towards Merano, most of the foreign number-plated cars will still have a few hundred miles to cover, as they are heading towards the more popular and more crowded regions in Italy. 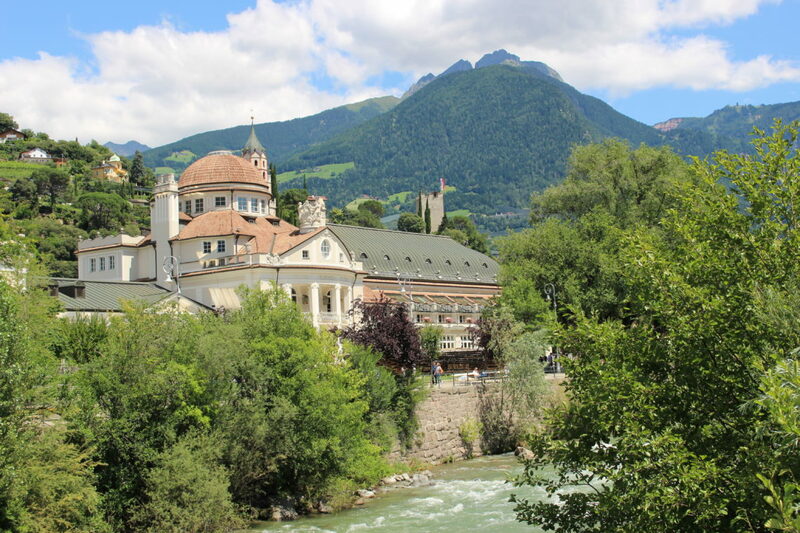 Merano is a breathtaking ancient spa town, formerly known and famous for its healing waters and treatments. Surrounded and protected by mountains it has a mild microclimate where oleanders and exotic palm trees flourish, giving this enchanting town a real Mediterranean atmosphere although you are still closer to Vienna than to Rome. Strolling along the riverside promenade is fantastic, especially after a very hot day in summer when the breeze of the river Passirio cools you down. You can sit down on one of the many benches, facing the impressive Kurhaus and imagine yourself an Austrian royal. Besides the old Kurhaus on the promenade, a new and modern city spa was built right in the middle of Merano. You enter the building, a steel and glass cube, from a central plaza stretching between the spa and the hotel. A magnificent oasis of peace and tranquility opens up to you once you pass the pay terminal. There is an extensive sauna area, tens of different massages or special treatments and 25 indoor and outdoor pools are waiting for you. The garden is a wonderful oasis where you can enjoy the spectacular scenery while floating in heated waters. After such a day of complete inactivity you can slip into your walking shoes – you could actually also do this the other way around. The Tappeiner Promenade offers a splendid view of the spa city. Protected from the sun by a mixture of Alpine and Mediterranean vegetation and without any difference in altitude, it is suitable for all ages and levels. The promenade was named after Franz Tappeiner, a well known Austrian physician and anthropologist.